Cold tolerance is the bright line dividing Fall Vegetables—like broccoli, spinach, and lettuce—from Summer Vegetables—like tomatoes, melons, and cucumbers. But it’s not the only line. Most summer vegetables are actually fruit, and the difference between fruit and vegetables isn’t just a botanical nicety. 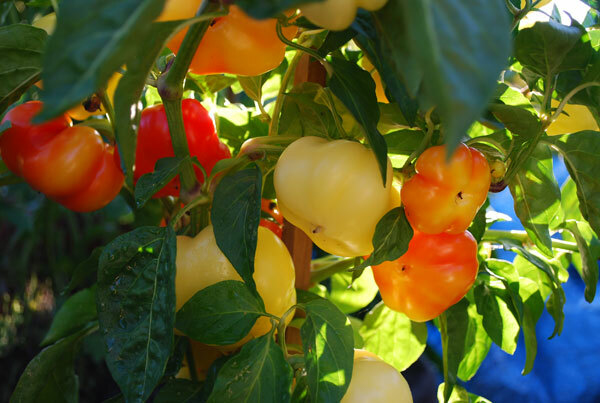 Fruiting plants came along later in plant succession, and have slightly different soil needs than fall vegetables. See Fruit vs. Vegetables below for more information. Of course, in northern climates with a single growing season, they’re all planted at once. Fall vegetables, also known as cool-season vegetables, are grown for their leaves, stalks, bulbs, or roots—as opposed to their fruit. 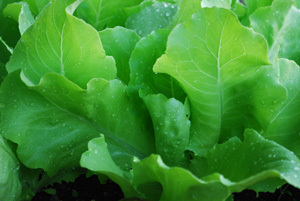 Leafy vegetables like lettuce, spinach, and Swiss chard. Cruciferous vegetables like broccoli, cabbage, cauliflower, kale, collards, and Asian greens. 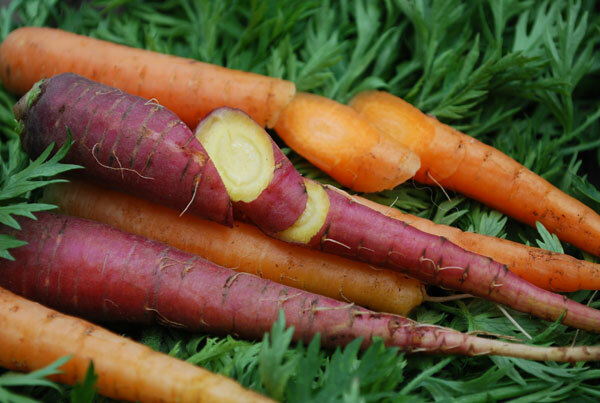 Root vegetables like carrots, beets, and parsnips. 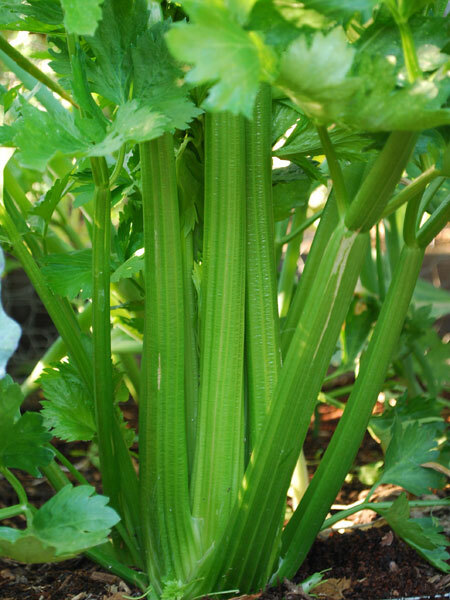 Stalk vegetables like celery and fennel. 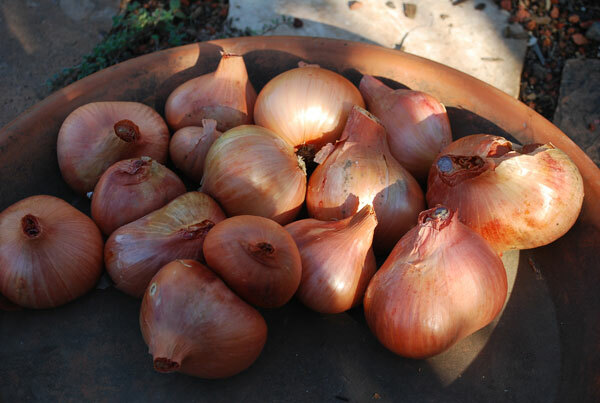 Alliums like garlic, onions, shallots, leeks, and chives. 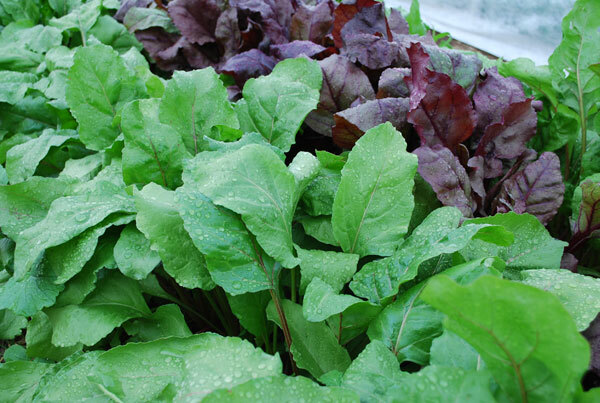 Fall vegetables grow best in the cooler temperatures of spring and fall. They thrive in temperatures of 50-70º (10-22º C), as long as they have plenty of water. Most can handle light frosts. Cruciferous vegetables (broccoli, cabbage, etc.) can freeze solid for a few days, and bounce right back when they thaw. The freezing weather only makes them sweeter (sugar acts as anti-freeze in plants). In warm-winter climates, fall vegetables planted in early September grow slowly through the winter months, then size up quickly as soon as the weather warms up in the spring. 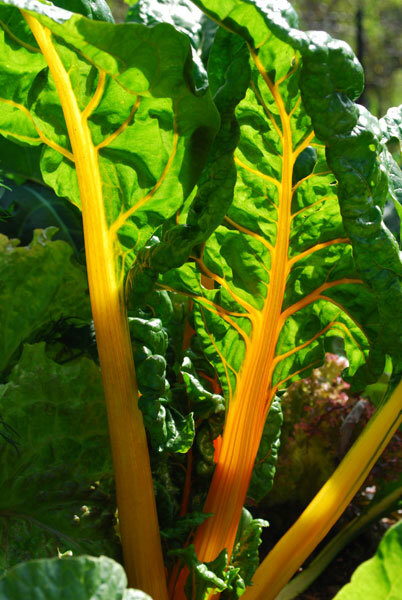 Most cool-season vegetables follow the same growth pattern. After germinating, carrots, spinach, and broccoli form a low rosette of leaves radiating out from the center. As long as conditions are good—steady water, decent soil, temperatures in the 60’s and low 70’s (16-23° C)—fall vegetables accumulate and store nutrients. 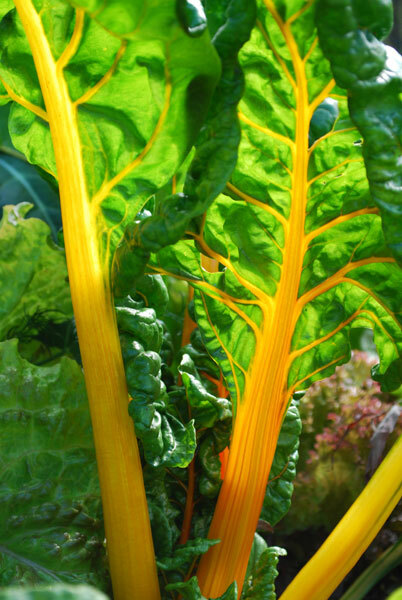 Carrots store nutrients in their roots, spinach in its leaves, and broccoli in its leaves and stalks. 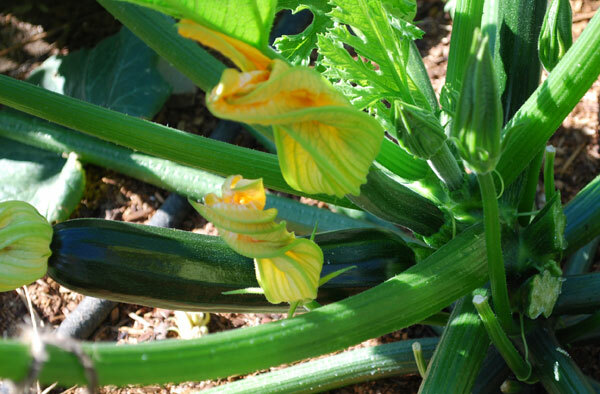 Fall vegetables need steady, continuous growth. Anything that disrupts this growth—like a spring heat wave, or drought—causes them to “bolt”, or send up a flower stalk. Once a fall vegetable starts to bolt, it won’t get any better. All the plant’s resources go into supporting and producing flowers and seeds. Nutrients are drained from the leaves, roots, and stems—the parts of the plants we usually eat—and used to produce seeds. Leaves, stems, and roots become tough and stringy. 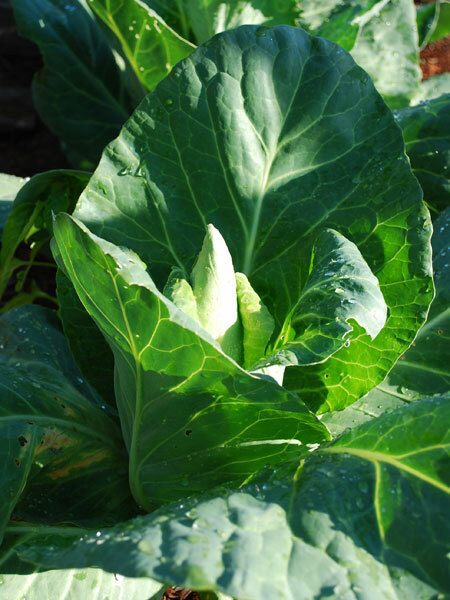 Harvest leafy fall vegetables at the first sign of a flower stalk, while the leaves are still succulent. Cruciferous vegetables like broccoli, kale, and cauliflower are obvious exceptions. 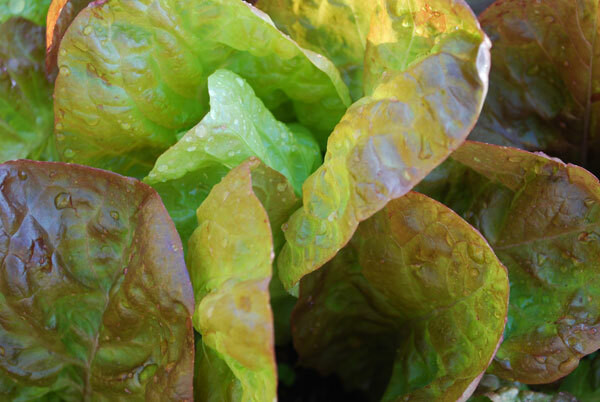 Steady water is the key to growing cool-season vegetables—especially in hot, dry weather. The plant must be fooled into thinking it’s perpetual spring—or fall. Steady water encourages continuous, succulent growth, and reduces the stress of high temperatures. Cool-season vegetables prefer a slightly less acidic soil (pH 6.5-7.5) than summer vegetables. Spinach and other amaranths grow poorly in acidic soils. See Changing Soil pH for soil amendments and application rates to reduce soil acidity. When growing fall vegetables, mix 2-3” (5-8 cm) of good garden compost or well-composted manure into the soil at planting time. Organic matter buffers soils, reducing extremes of acidity or alkalinity. Plants grown for their stalks and green, leafy vegetables are heavy feeders, and need supplemental fertilizer. Broccoli, cabbage, cauliflower, kale, spinach, Swiss chard, fennel, and celery—all need a little extra nitrogen for the best yields. Because nutrient cycling is slower in the cool temperatures of spring and fall, quick-release, animal-based organic soil amendments work better than vegetable-based amendments, like alfalfa meal or soy meal. Worm castings, fish meal, and composted animal manures are good choices when temperatures are cool. For details and application rates, click Here. In late spring or early fall, when the soil is warmer, plant-based organic soil amendments like alfalfa or soy meal work well for fall vegetables. For details and application rates, click Here. 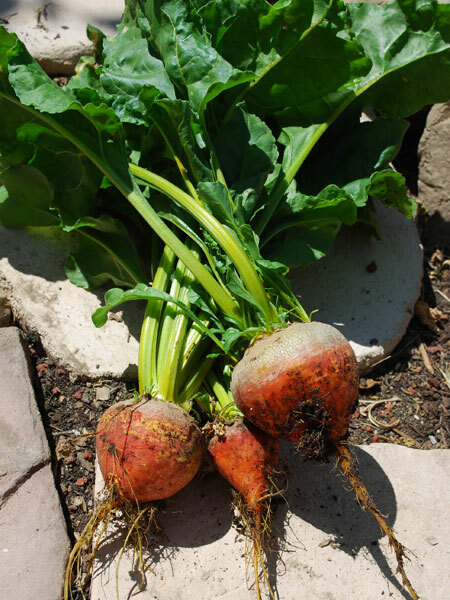 >Root crops like carrots, parsnips, and beets do not need supplemental nitrogen. Too much nitrogen results in excessive top-growth and small roots. 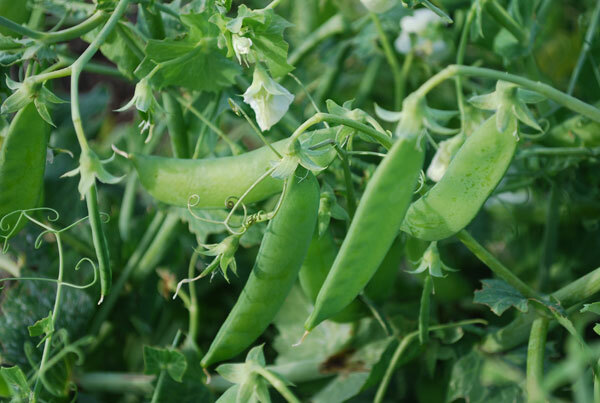 Cool-season legumes like peas and fava beans also need no supplemental nitrogen—although they do like organic matter in the soil. For these plants, soil nitrogen inhibits the nitrogen-fixing ability of the Rhizobia bacteria that colonize their roots, reducing the amount of free fertilizer they supply to your garden. With fall vegetables, it’s all about water. Regular, steady water, a little bit every day. Unlike summer vegetables, fall vegetables actually like water on their foliage—especially on a hot afternoon. Overhead watering in the heat of the day cools the leaves and soil, in addition to providing needed irrigation. It drops both daytime and nighttime temperatures into the 55-65° (13-18° C) groove that fall vegetables thrive in. 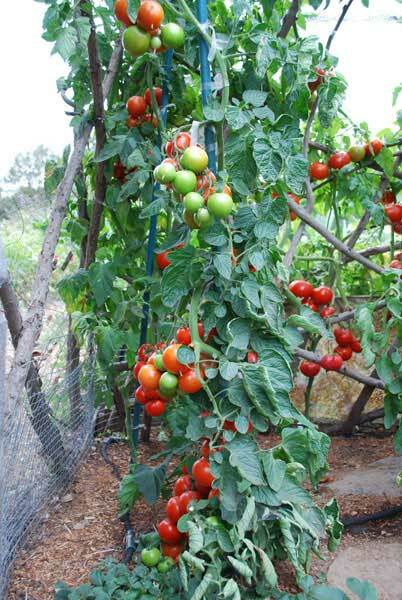 Except for peas, which need trellising to support their vines, cool-season vegetables do not need caging or staking. Summer vegetables are actually fruit, not vegetables—although some (like potatoes and sweet potatoes)—are grown for their fleshy tubers. Most evolved in the tropics. Unlike cool-season vegetables, frost kills them, so in the northern hemisphere, they’re planted as summer annuals. They have to be planted after the last frost date in the spring, and ripen fruit before the first frost of the fall. 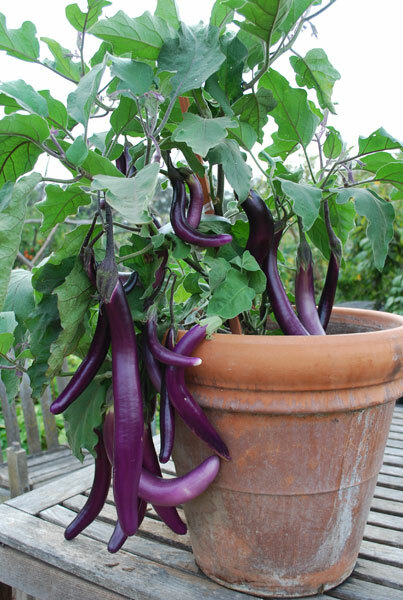 Summer vegetables need higher temperatures for seeds to germinate, and summer heat to flower and set fruit. Nightshades (tomatoes, peppers, eggplants, and potatoes), cucurbits (cucumbers, melons, squash), beans, and corn fall into this group. 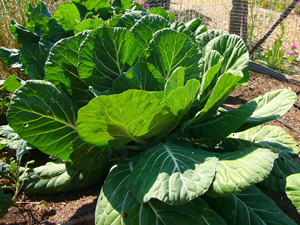 Most summer vegetables need a long growing season to produce the most fruit. Northern and alpine gardeners need to start seeds under lights indoors about 8 weeks before the last frost date for their area, or purchase seedlings from local nurseries to set out after all danger of frost is passed. Summer vegetables are heavy feeders and need supplemental nitrogen, especially during the first part of the growing season. However, too much nitrogen—especially late in the season—results in a lot of leaves and less fruit. 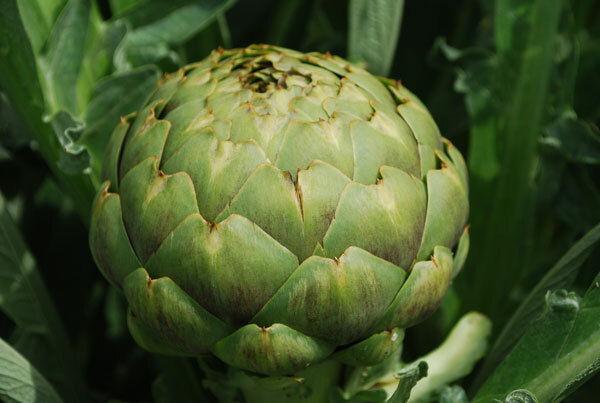 Although they can be grown in the same soil as cool-season vegetables, summer vegetables prefer a slightly more acidic soil (pH 5.5-6.0), and they require higher levels of phosphorus and potassium in the soil to flower and set fruit. The idea is to have large, robust plants with a lot of leaf area when it’s hot enough for summer vegetables to flower and set fruit. The leaves produce the sugars that sweeten the fruit, and shade the fruit to prevent sunscald. Because soil temperatures are warmer in summer and nutrient cycling is faster, Vegetable-Based Organic Soil Amendments like alfalfa meal or soy meal can be added to the soil at planting time. 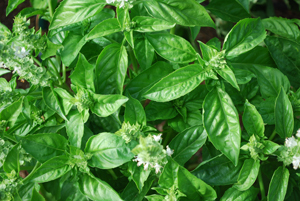 5-8 lbs per 100 square feet is usually sufficient for a reasonably fertile garden soil; use up to twice as much for lean, sandy soils. Greensand is a good source of organic potassium; it breaks down over 2-3 years, slowly releasing potassium into the root zone. 2 lbs per 100 square feet works for most garden soils. Kelp Meal supplies potassium, as well as trace minerals that help boost plant immunity. 1lb per 100 square feet is a good application rate for average garden soil. Do not apply at higher rates; kelp meal contains plant hormones that inhibit growth at higher application rates. For information on these and other Organic Potassium Sources, click Here. Colloidal (Soft) Phosphate is a good source of supplemental phosphorus. 4-8lbs per 100 square feet is a good application rate for a decent garden soil. For information on these and other Organic Phosphorus Fertilizers, click Here. Summer vegetables have a different watering regime than fall vegetables, and the plants may need to be staked, caged, or trellised to keep vines from breaking when they’re heavy with fruit. Watering Summer Vegetables Unlike fall vegetables, which need continuous water, summer vegetables perform better with deep, less frequent watering, especially early in the season. They still need regular water, but if the plants dry out a little between waterings, it forces them to send their roots deeper into the soil, resulting in larger, stronger, more robust plants. Once the plants start setting fruit, regular watering is best. Irregular watering as fruit ripens may result in split fruit. 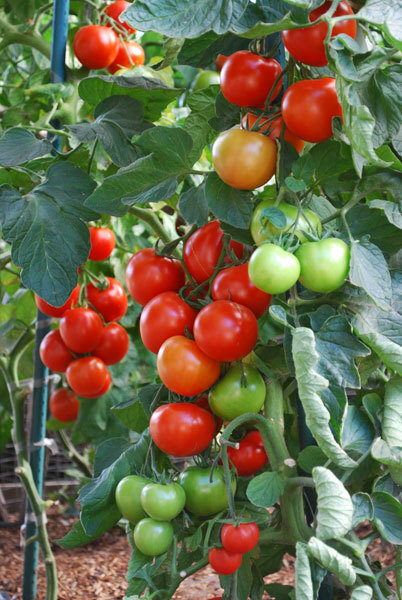 Drip irrigation is better for summer vegetables. 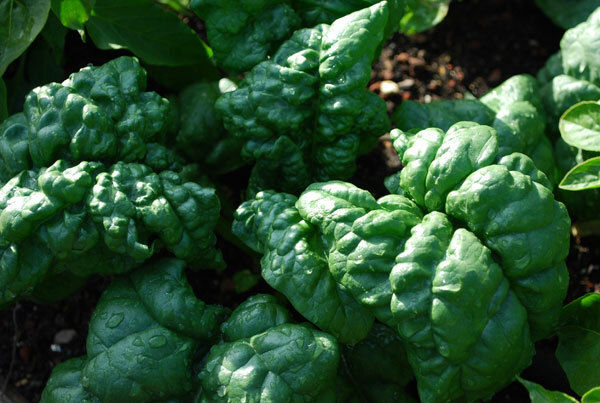 Plant diseases that plague many summer vegetables spread readily on wet foliage. 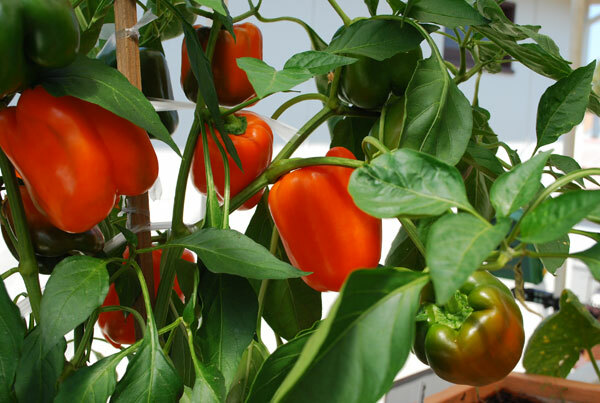 If you do use overhead watering with summer vegetables, water early in the day so the leaves have a chance to dry off before nightfall. 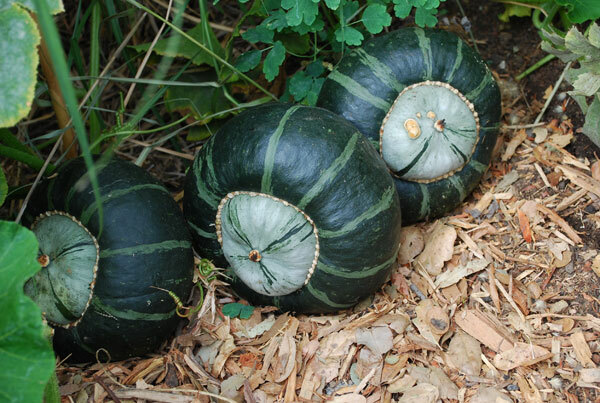 Most summer vegetables need support in order to keep the fruit off the ground. 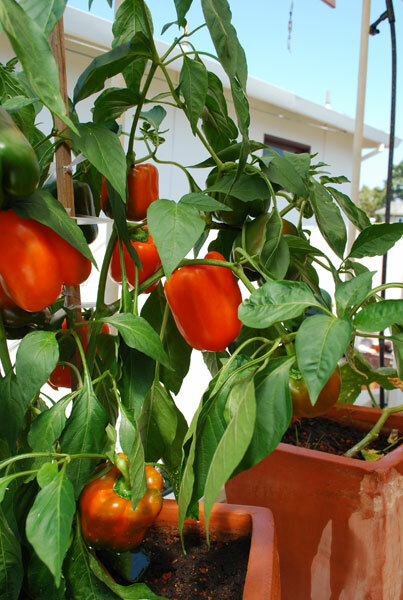 Tomatoes, peppers, and eggplants all need caging or staking to support the plants when they’re heavy with fruit. 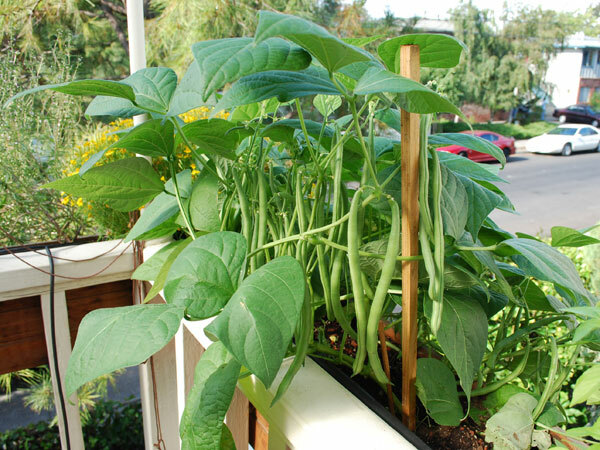 Pole beans and cucumbers need trellises to climb on. This is an oversimplification, but botanically, it’s a fruit if we eat the part of the plant that contains the seeds, and a vegetable if we eat any other part of the plant—the roots, shoots, leaves, flowers, or stalks. By this definition, “vegetables” like tomatoes, squash, and cucumbers are all fruit. I’ll bow to produce aisle usage and refer to these fruit as vegetables, but the distinction is important. It’s important because the ancestors of fruit and vegetable plants evolved under different soil conditions, and if we’re growing our food without chemical props, we can start by understanding how the natural world operates without them. 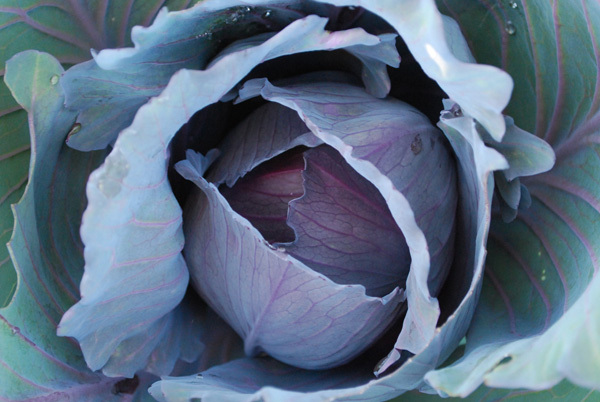 Fall vegetables evolved from weedy grassland ancestors in thin, bacterially-dominated soils. They are non-myccorhizal. They do not form symbiotic links with beneficial soil fungi, like fruiting plants do. This means the only nutrients available to them are those within their root zone. Both summer vegetables and fall vegetables benefit from a good organic fertilizer like Dr. Earth Organic Tomato Vegetable Herb Fertilizer . This is a balanced (5-7-3) blend of fish meal and alfalfa meal for early-season growth, feather meal for mid- to- late-season growth, soft rock phosphate and fish bone meal for phosphorus, and kelp meal for potassium and boosting plant immunity. It also contains 7 strains of probiotic soil microbes, along with ecto- and endo-myccorhizae. 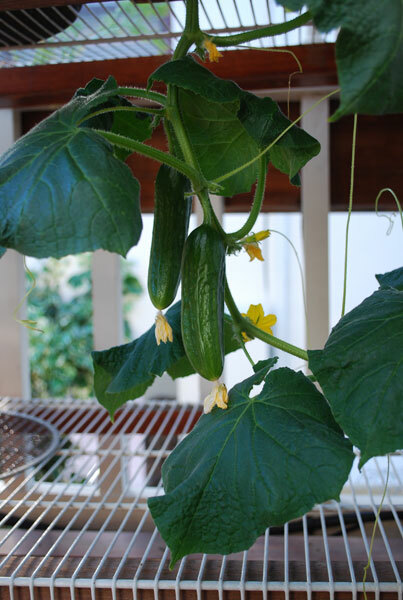 Summer vegetables (fruiting plants) need phosphorus and potassium to flower and set fruit. These elements tend to be spread thinly in soils. To get enough of them, fruiting plants form myccorhizal associations with beneficial fungi in the soil. Fungi are creatures of the soil. The threadlike hyphae of the fungi connect to the plant roots, plugging them into a vast underground network that can run for hundreds of yards underground, all of it threaded together into a single organism that can transport nutrients anywhere in the network. The largest living organisms on the planet are fungi. Fungi are adept at concentrating nutrients—like phosphorus and potassium—that are scattered far and wide in the soil. The fungi supply phosphorus and potassium to the fruiting plants, and receive carbohydrates and amino acids in exchange from the plants. Mycorrhizae help fruiting plants assimilate nutrients from the soil in much the same way human gut bacteria help people assimilate nutrients from our food. Okay, So What Does this Mean for Organic Gardeners? After all, gardeners can amend the soil with colloidial phosphate and greensand to supply phosphorus and potassium to fruiting plants, so they don’t have to rely on mycorrhizal networks. And in frequently tilled gardens, where the fungi are continuously broken up by cultivation, this is a good way to supply them. Summer vegetables and fruit evolved absorbing phosphorus and potassium with the aid of soil fungi. One way gardeners can facilitate this process is to use an organic fertilizer like Dr. Earth Organic Tomato Vegetable Herb Fertilizer that supplies mycorrhizae at the time of planting. Endo-mycorrhizae cause roots to branch finely into the soil, increasing the surface area of roots in contact with the soil, so they pick up more nutrients. Another way is to minimize soil disturbance once the plants are in the ground. This allows fungal networks to grow and spread through the soil.